From floating cards to many different ways to "find a card," these are so simple that anyone can feel like a magician. You just have to know the secrets and we'll tell you everything you need to know. There are many easy card tricks, but this is definitely one of the best. It's the perfect first trick that any kid can learn and is a great foundation for other, more complicated tricks. This is a basic "find a card" trick that works with a spectator. When you learn it, you'll understand how magicians can guess your card every time. Plus, it's fun to combine this one with "the rising card" and make it into even more of a spectacle. The rising card is a classic magic trick and it's another simple one that anyone can learn. The goal here is to defy gravity as your spectator's card mysteriously rises from the deck. Does it do it all on its own? As you'll soon find out, the secret lies in carefully positioning your fingers. All you need for this one is a little patience and a deck of cards. Want to know the secret to levitating a playing card? This trick is surprisingly easy and once you learn it, you'll dazzle your friends as a playing card floats from one hand to the other. For this card trick, you'll need to create a gimmick that creates the illusion. It requires a few common items you probably have around the house. Grab your deck of cards, a straw, some black thread, tape, and scissors and you're ready to get started. A black string is a magician's best friend and did you notice that they almost always wear black clothes? It helps with the illusion when you want to pull off tricks like floating cards. For this cool trick, we're going beyond levitation and actually spin a playing card in midair. It will then mysteriously rise up to your hand. It's incredibly easy once you know the secret. Get ready to break the laws of gravity, at least in the eyes of people watching you. This fun visual trick shows you another way to make a card seem like it's floating over your hand. You'll create a gimmick card for this one, so make sure you have a playing card you can cut up. The only requirement is that the design on the back match the face card you're working with. Beyond that, a little glue and a pair of scissors are all you need. Levitation is so cool that we're going to show you yet another way to float a card. After all, even beginning magicians can use an extra floating card trick, right? This time, we'll suspend a playing card over a full deck. It requires a different type of gimmick card, so even though it's the same effect, you will learn a new magic technique. It's fun and easy, perfect for magic rookies. Everyone will think you've magically turned your hand into a magnet for cards when you learn this trick. It's a refreshing departure from the usual "find a card" plot. Making the gimmick card is the key to holding all ten cards in your hand while all your fingers are completely flat. Scissors, glue, and a little practice are all you'll need. This is one of the very best card magic tricks that a beginner can learn and perform. It's easy and requires no sleight of hand, just a full deck of cards. For this trick, you'll have someone pick a card, then lose it in the deck. They'll even tell you the name of their card, so where's the magic in that? The revelation happens when you spell out their card and it's right there. It's a baffling trick that definitely has an impact. An interesting twist on the "find a card" game, "dowsing" for a card is fun and simple. This one relies on your acting skills, so get ready to put on a performance. Dowsing is a rather old-fashioned way of finding water and minerals below ground. In a similar manner, you'll use a "dowsing rod" (a pen or stick) to find a spectator's card in the deck. It's one more way to practice your ability to find anyone's card every time. This one is a sleight of hand trick and it's a great way to hone your skills of magical deception. The reversed card trick is easier than you can imagine and when you see how it's done, a new world of magician's secrets will open up to you. For this trick, you'll simply have someone select a card and put it back in the deck. The trick? While they were paying attention to their card, you were reversing the deck. That makes it easy as pie to find their card for the big reveal. Do you have the ability to read minds? It doesn't matter because this card trick will have everyone thinking that you can. It's another favorite and one that you can add plot twists, stories, and all sorts of fun. This is an excellent card trick for beginners that combines mind-reading with a prediction. Follow the instructions and you can make your own gimmicked deck that you can carry around with you to perform this stunner anywhere you go. If you want to ​do a trick with tons of misdirection, be sure to learn how to deal a royal flush. You'll find that it builds your people skills, which is essential to any great magic trick. To make sure you deal yourself a royal flush, you need to rig the deck. When it's time for the show, you'll deal a poker hand, just like normal, but you'll be the player with the best hand. You'll look like a pro gambler, but don't bet money or you could have some angry friends. When you want to play a few mind games with your friends, learn this easy magic trick. It's quite simple, which is why it's great for beginners. You will need five cards each from two different colored decks and a calculating mind to pull it off. For this trick, someone chooses a card and in the end, you show them that their card was the only odd-colored option. How does that work? It's all about how you display the cards, which is why you need to get sneaky to make it work. 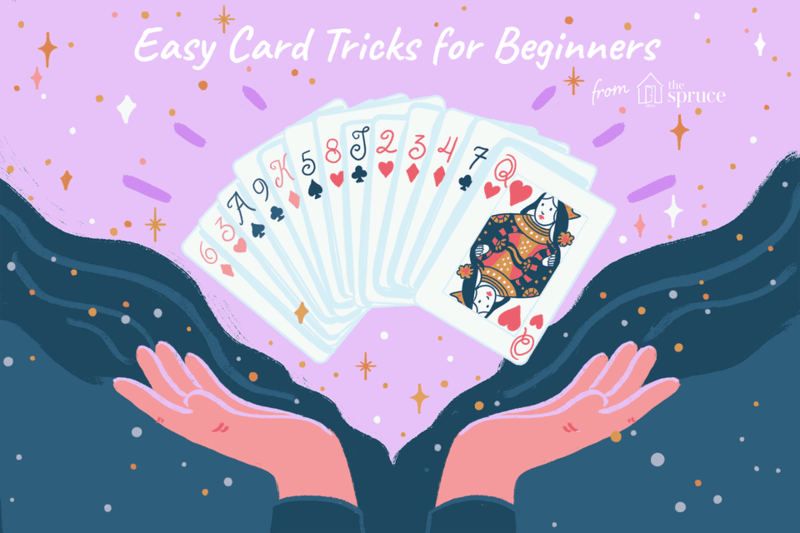 In this excellent beginner's trick, you not only find the spectator's selected card but somehow manage to locate the four aces. It's a double whammy with two revelations, which is why it's one of the best. This is another trick that requires a stacked deck, which you'll prepare ahead of time. Once everything's in place, the trickery begins. There are a lot of steps, but the end result and "How'd he do that!" is totally worth it. "Do As I Do" is a great card trick that offers lots of audience interaction. It can be performed any time you have two decks of cards and it has lots of comedic opportunities. Best of all, the ending is surprising with an inherent build-up. The performance is simple: a spectator follows every move you make with your deck of cards, then you switch decks before choosing a card and memorizing it. You both place your card back in the decks, swap again, then you find their card. Once the trick is over, the secret is long gone and there is nothing for spectators to find. Learn an old-school magic trick and test your skills at tracking where everything's going. While your spectator thinks he's randomly cutting cards, you know that he's going to leave an ace on top of each pile in the end. The secret is that you've purposely placed the aces within the deck. You'll then walk them through strategic cuts, leading to the big reveal. There are plenty of opportunities to add spectacle here, too. Just be sure you don't get distracted.